Keep it shine and bright by wearing sparkles in your life. 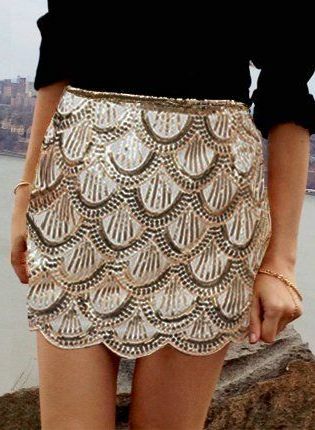 In today's post I want to draw your attention to amazing sparkle skirts that were captured in the streets of big cities, like New York, Milan, London and Paris. Just imagine yourself wearing a sparkling staple that makes everyone's attention on your persona. 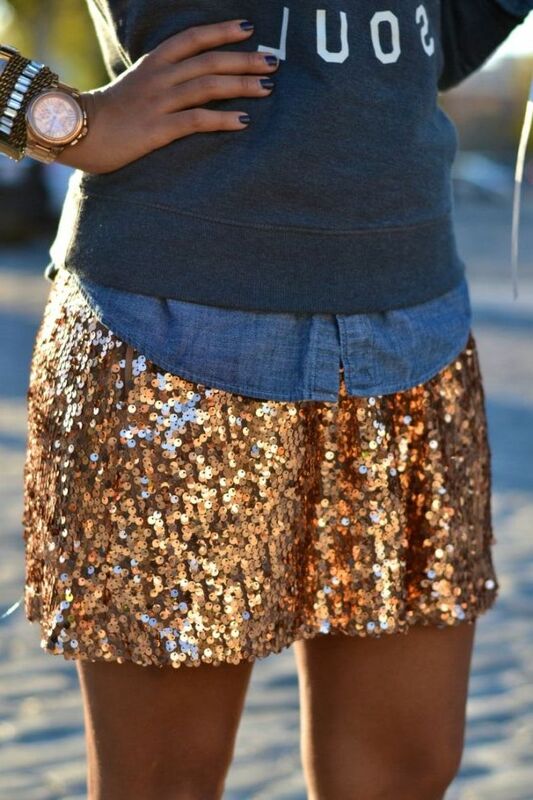 Of course it is better not to risk going overboard with sequins, otherwise you will look too much glamorous. That's a perfect glitter guide for those chics who want to show off in the streets. 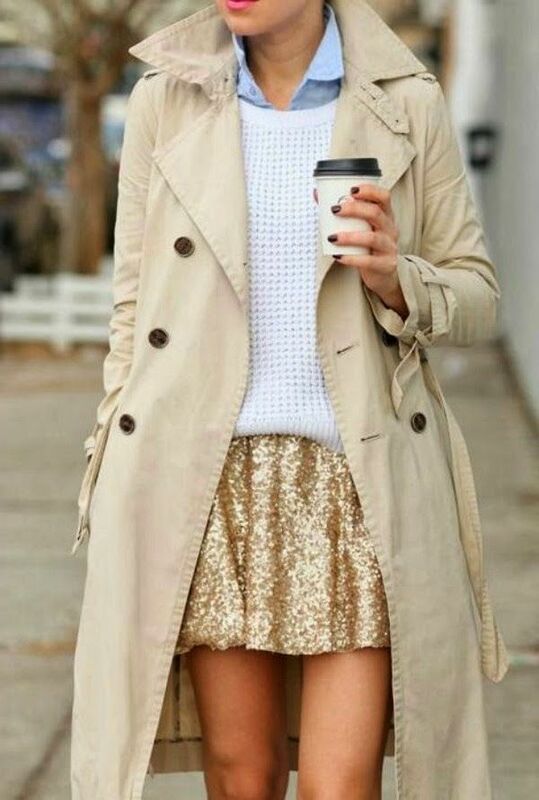 During the windy days it's great to wear a cream beige trench coat worn atop white sweater and shimmering gold mini skirt. 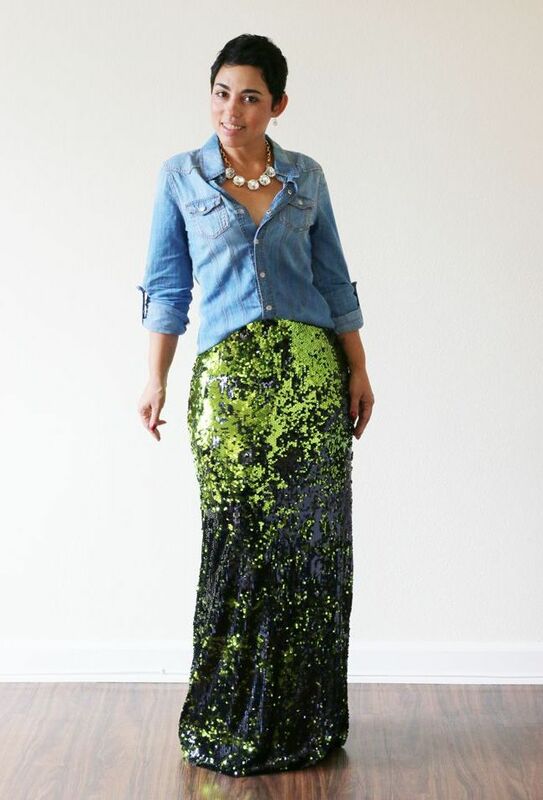 If you are one of those ladies who is still wondering what to wear with your pretty shimmering staple, then I am here to help you finding the best looks that ideally match this bottom. This bottom is a fun piece, which definitely works great with your down street and high street basics. Keep it casual urban and try on a denim shirt tucked in green-emerald seqwuined maxi staple. A fluffy red sweater looks great with knee-length sequined bottom. Update this party look with black heeled sandals. Here we see a mini gold sparkling bottom worn with a chambray shirt and cool pullover. I love the street style vibe of this outfit. There is kind of retro touch in this outfit. We see a white 1/2 sleeved top with black stripes paired with silvery sparkling midi pencil staple. Finish the look by adding statement black sunglasses and cool geometric shaped clutch bag. The light blue chambray shirt is worn underneath white cable knit sweater and styled with flared mini gold sparkling skirt. Keep it chic and sophisticated by wearing a gorgeous black turtleneck with silver shimmering bottom. Keep it casually glamour by wearing a loose-fit knitted sweater with mini and opaque tights. 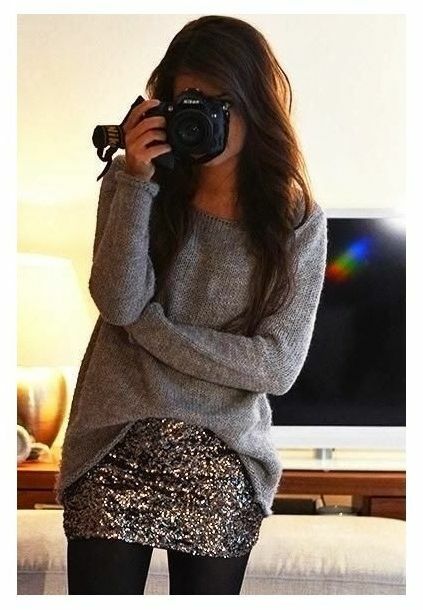 Keep it awesome and bold by wearing a loose-fit knit sweater tucked in mini shiny bottom. How about wearing a black pullover with a high-waisted midi bottom? Finish the look by adding a checkered wool scarf, gold hue clutch and pointed-toe heels. Keep it sophisticated and somewhat retro inspired. 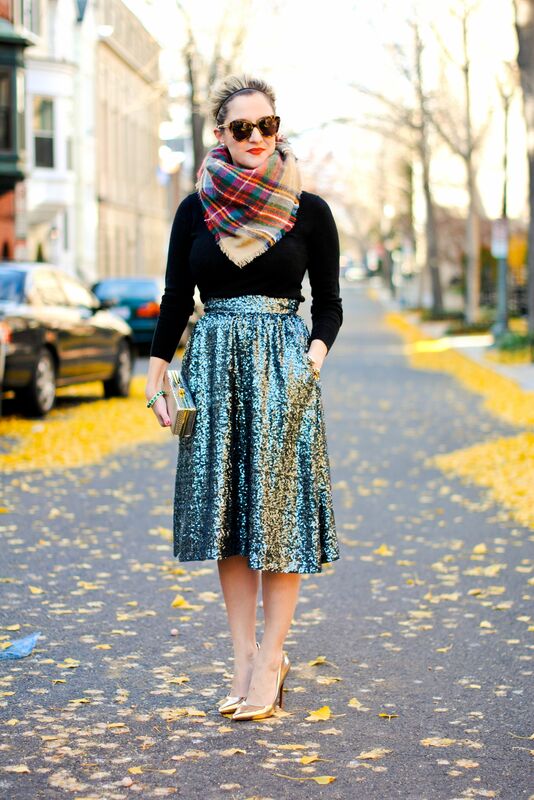 We see lady wearing a cable knit sweater paired with pinstripe gold-black midi pencil skirt. You are going to see amazing spring and winter looks and styling tips to wear your stunning bottom piece. 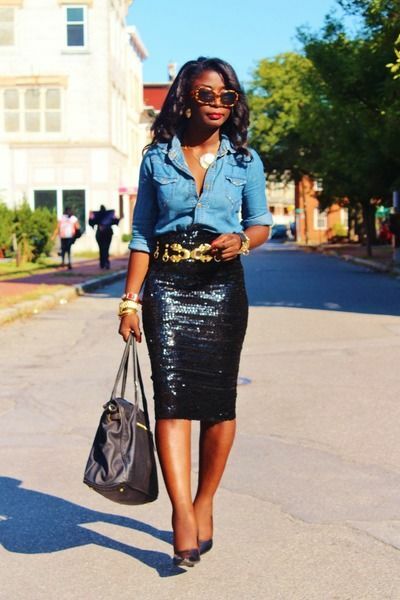 Here are different street style looks to wear sparkle skirts with boyfriends and ladylike garments.